Man, the last 10 years have been a journey. I packed my kitchen up this last week and sat in an empty house, paper plates and take out for the last few days. I am a cook for a living – I feed people, especially my family. And it’s tough to have everything packed and still enjoy meals that are easy and heathy. Rewind through time about seven years ago, when I was pregnant with Noah. Sometimes back then, I’d have Mike stop at the QFC deli and get me a chicken salad sandwich, along with banana cream pie. It was a simple, protein-packed meal and such a splurge for two people who were careful where every penny went. But when you are pregnant you need some foods the way you need air or water! He’d bring home a delicious sandwich with red leaf lettuce, whole grain bread, dilly chicken salad, red onions, and sometimes tomatoes. When Kroger reached out for me to write about their new healthier chef-prepared chicken salads at QFC, I immediately said, “Oh my goodness, Mike, remember? !” We lived in a different city altogether then, and I had no idea what was in store for us. We were going to have a baby and our restaurant was closing its doors at the time. We were kids: clueless and unprepared. But when I look back, there were always special times and wonderful moments, times where joy had a place in our hearts and in our home. Times like when we’d eat those chicken salad sandwiches and banana cream pie together, anticipating our baby, just trying to figure life out and start a family together. That next year, we’d move from Puyallup, Washington to Issaquah and start fresh, baby in tow, wide-eyed, expecting good things. Noah brought us such joy. Even after he was born, we’d swing into the deli and grab those same sandwiches whenever we needed a fast and tasty meal that wasn’t drive-thru. Nostalgia plays a huge part in my life. Memories, for me, are reminders that life is and was and will continue to be good. Even during painful times, life is good. And food is such a distinct way to relive specific moments in your life. The smells, the tastes can really bring you back. Here we are, in 2018, packing up our home again. We are embarking on the next phase, a fresh chapter, and Mike swung into the QFC deli to grab a pound of that same wonderfully delicious dill chicken salad that’s been reimagined in a healthy way. Kind of like us after all these years: the same but reimagined. We’re ready for anything. Two kids later and moving on. I walk these halls for the last time, and turn in our keys today. I can’t help but think that this is where we started, this is where my family began. This is where we learned to love. Inside these walls we’ve grown together and fought hard to keep going. I repeat: we are ready for anything. Food will always evoke strong memories and emotion for me. 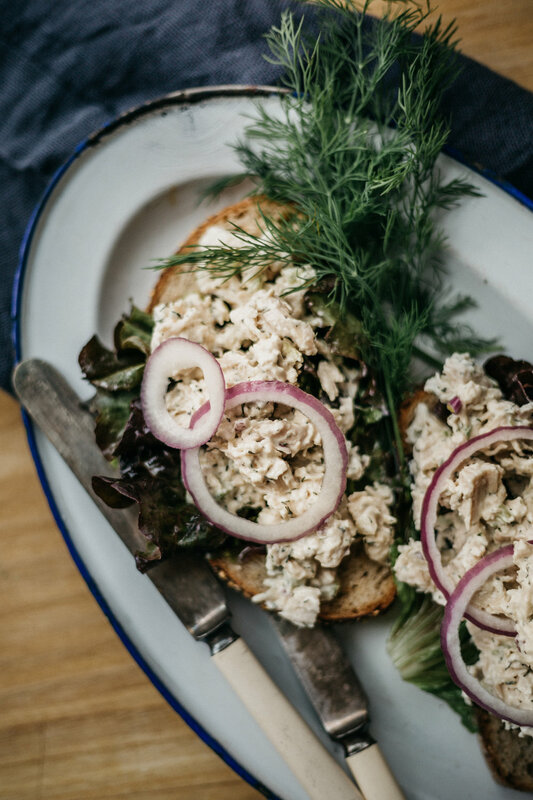 I bet you never thought anyone could cry about chicken salad, but these dang sandwiches remind me to be hopeful – the future, while uncertain, is an intangible gift. There is hope in those limitless possibilities. If any food reminds me to hope, man, then I’ll take it. I have a personal history with the QFC classic dill chicken salad – it’s remarkable – but they also have lemon basil, apple grape walnut and cashew, and currant and curry. Go grab some salad from your QFC deli and start dreaming. The QFC chef-prepared chicken salads are available through delivery and ClickList. I know these next seven years will be even better than the last, filled with more memories, more meals together, and plenty more dreaming. This post is sponsored by QFC.